You're on the right page if you searching for AAUA admission requirement and process. The post gives you AAUA admission portal, thee university courses, post UTME cut off marks, catchment and admission list updates. You will also learn about the university direct entry admission process and school fees among others. Even though all universities, polytechnics and colleges in Nigeria follow almost the same procedures in their admission processes, Adekunle Ajasin University has some uniqueness in her own approach to admitting students. All admission seekers must know these or risk being deprived a space at the end. Below is the quick guide to gaining admission to the state-owned university in Ondo State. It's important that this post remains most comprehensive write-up that holds you by the hands and shows you the right path into the one of the most competitive state universities in Nigeria. Don’t make attempt for the school if you'd not got SSCE result she wanted for her courses. You can however use awaiting results if you are certain that you’d written WAEC, NECO, NABTEB, etc and you’re waiting the results. Please note that such awaiting results should be released before the school’s post UTME closes. You will need to fill it during the post UTME. And as soon as it's released, you must return to any CBT centres to scan and upload it to Jamb registration portal. It's necessary please. In your SSCE, you must have at least 5 credit passes in relevant subjects to your proposed course in the school. For example, a student proposing microbiology must have English, Maths, Biology, Chemistry, and Physics. If there are any deficiencies, you may be out of luck. It should be noted that different courses require different relevant SSCE results or grades. In some cases too, AAUA requires specific conditions which may not be general to other schools. They may accept passes in certain O’level subjects such as D7 or E8 in Chemistry etc. This is why you have to study JAMB brochure very well before applying. I detailed the importance of studying JAMB Brochures and what to look for in my post "Study JAMB Brochure to Avoid Admission Errors"
Yes, I know what you’re thinking. You wonder why you must choose AAUA as first since She's just a state university. You believe your first choice university should be federal, then, state the second and so on. No school is accepting second choice any longer. Even though some universities may give you admission having taken them as second, yet they will later instruct you change them to your first choice on the JAMB portal before you can be admitted fully. If by now, you’ve taken AAUA as a second choice, consider changing them to your first choice before post-UTME or after, if you truly need admission from them. See also: Choosing Universities, Polytechnics and Others as Second Choice: Will they Give you Admissions? whether the course you want is available in the school. This is easily solved at CBT centres. They can’t register a course for you unless the school is offering it. This is because JAMB registration platform will not match a school with the courses she's not offering. But should you get to CBT centre before you can confidently know if a course is available in a school or not? No! You can have answers to that if you study and understand you brochure before going for registration. JAMB brochure is your best bet. about the O’level or SSCE subjects required for your proposed course. As a matter of fact, course requirements in O’level results are important. Check your JAMB brochure to see this and make sure you’d already had them (or expecting if you're awaiting the results) before choosing a course. Don’t be confused. If they tell you to have at least 5 credit passes, it doesn’t mean in any subjects. It means in relevant subjects to your proposed course. See JAMB brochure please. about UTME subject combinations. Just as your SSCE subjects, you must write the right subjects for your proposed course in UTME. This is one of the problems that led to being deprived admission by Adekunle Ajasin University. I’d seen even one of their their Pre-degree students being deprived an offer because of wrong subjects combination in UTME despite her 287. JAMB brochure is very resourceful to guide you on this and it’s very IMPORTANT. You can use the guide here to find out if you're eligible for your proposed course at Adekunle Ajasin. You don't need brochure for that. about special consideration (waiver) remarks. In case you don’t know, Adekunle Ajasin University usually gives some conditions to their O’level and UTME subjects. They explains this under "special considerations (waiver) remark" in JAMB brochure. This section will tell you if your proposed school has some conditions you must meet for certain courses. It’s important you read thoroughly the section. You can read my post, "Study JAMB Brochure to Avoid Admission Errors" as a guide to know what you look for in the brochure. 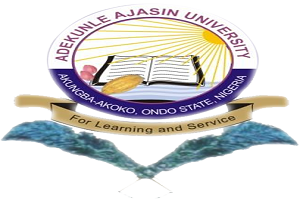 Adekunle Ajasin will sell and ask each admission seekers to register for her Post-UTME. The school conducts computer-based entrance tests for all her applicants. But before then, you must have scored 180 or above in your UTME. AAUA JAMB cut-off mark is 180. This may change. And if it does, I’ll definitely update this post. During Post-UTME registration, you’ll be asked to select the right subjects to write in Post-UTME test. Your subjects are usually four. Be sure you select combination you’re sure to do well at. Once your Post-UTME result is out, it’s over 100. The school will then match your mark with the departmental-cut-off mark to see if you qualify for the course you proposed. Note that this method of calculation may change. There're years when AAUA used only the mark in post UTME for their admission. Then, you will have to match that with your departmental cut-off marks. Departmental cut-off marks can change from one year to another. But if you’re interested in the recent departmental cut-off marks, you can see a post here. Note: Don’t take it as what will be used this year. If you, at the end make it, congratulation! If however, things are not as expected, don’t panic. AAUA will announce change of course registration. This will be done on the school website, but at a later date. You must be at alert for the announcement of the change of courses. This exercise usually lasts about three days. AAUA can send SMS sometimes to the affected candidates or announce it on the school’s website. Meanwhile, AAUA Pre-degree students may be the few to benefit from this exercise as the management may deem fit. 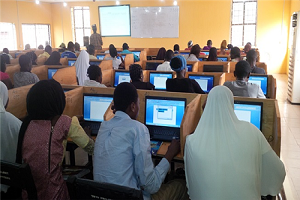 If you’re not lucky to see the course you prefer during change of course exercise or it’s not conducted for this year, consider JAMB change of institutions to any other institutions who are yet to conduct their Post-UTME. The Vice Chancellor has approved that admission be offered (at no extra cost) to some of the POST-UTME candidates in the institution’s Part-time Programme to starting from 2017 admission exercise. Those who scored less than 40 in the Post-UTME and other Post-UTME candidates, who may wish to take advantage of this offer, should visit www.iptp.aaua.edu.ng/offer for more details. This offer is usually opened to applicants who score below 40 which is the cut-off marks for their admission. 6. Gain Admission to AAUA with Direct Entry. This section is for those applicants seeking admission to Adekunle Ajasin University through JAMB Direct Entry. These are applicants already done with their Bsc, HND, ND, NCE, IJMB, JUPEB etc, and wish to continue to their courses or related ones at AAUA. have at least upper credit for ND or 9 points for NCE holders. Applicants with HND with upper credit or distinction may need to speak to the school admission office to know if they can be considered to 300 level. Most schools may give you such a privilege. 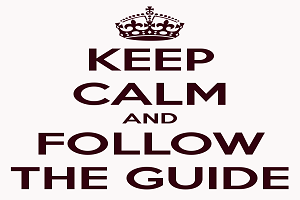 You need to study JAMB brochure for your course. In fact, JAMB brochure is more needed by direct entry applicants. AAUA and any other schools usually state special conditions for some courses under "special consideration (waiver) remark" section in the JAMB brochure. It will be wise of all candidates, especially DE applicants, to study and understand this. You’ll thank me for it. Adekunle Ajasin is usually lenient with her pre-degree students. They sometimes consider lower marks than 180 for them in UTME and same in post-UTME. As if that is not enough, they still give you a chance to partake in their change of course exercise, even if they don’t allow others. However, a pre-degree student may not eventually do some courses in 100 level because courses approved for the programme are limited. For example, their pre-degree doesn’t have Law, Economics among others. The school also runs her own JUPEB programme. After completing this one-year course and possessing the right grade as explained in the brochure, you can obtain JAMB Direct entry form. Then fill in the university as your first choice. The university is kind to admit all their JUPEB candidates if they pass the course and offer them spaces to 200 level courses of the institution. Note that, you can as well use your JUPEB result for admission to other institutions accepting it. You can see the list of such schools in my post, "IJMB, JUPEB and Cambridge A’level: Opportunity to Gain Admission directly to 200 Level"
Do you still have question regards this topic, kindly drop it in the comment section below. Sharing this post with your Facebook, Whatsapp and Twitter contacts may not take more than a minute. But I will be forever grateful if you just do that. It means a lot to me. I leave sharing icons below this post for your convenience.